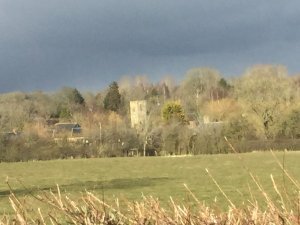 The current limestone church dates from the 13th century and quite possibly replaced a wooden Saxon church which existed on the site when the Domesday Book was written in 1086. The church still uses the stone Norman font which was probably installed in the original wooden Saxon church. In the time of Henry II land was given to "God and St John the Baptist" and the oldest parts of the stone church (the Nave and North aisle) were built. The fine tower was added later, in the late 13th or early 14th century. The bells were cast by the Whitechapel Bell Foundry, with the earliest dated 1764, and the "newest" dated 1809. They can still be sounded using a "chiming" mechanism. In 1859 the South aisle and the porch were added. This increase in capacity was to provide a place of worship for the boys from St John's Reformatory, which had been built to the north of the village a few years earlier. The evidence of their attendance can still be seen in the names and initials carved into the wooden pews! The boys from the Reformatory still attended services until the 1970s. An organ was installed in 1909 paid for by an organ fund started in 1905, though this has been replaced since by an electronic version. Electricity was installed in 1937 and the earlier warm air hypocaust heating was replaced in 1948. If you would like access to look round the church between services please see the information in the church porch of how to arrange this. 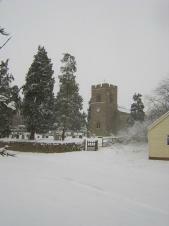 We are part of the "Pattishall with Cold Higham and Gayton with Tiffield" Benefice. Our services follow a regular pattern, as listed below. Services at the other churches within the benefice co-ordinate with services in Tiffield to provide a full programme for local worshippers. All are welcome to attend services within the benefice. 4th and 5th Sunday of each month - Service in rotation around the four Churches within the Benefice. All are welcome to attend services at all churches within the benefice.